I knitted myself a beret this weekend. 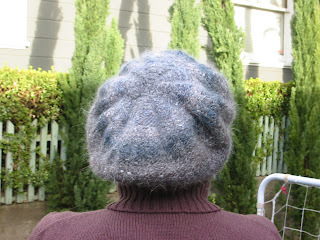 Its the last minute purl beret from Knit and Tonic. 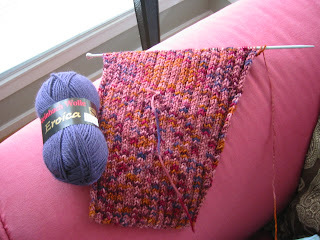 Knitted in the recommended yarn: Noro Kochoran in Colour #1. 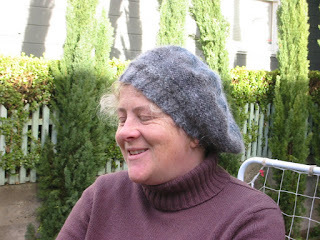 The Kochoran is a wool/silk/angora blend and knits to a lovely soft fabric. It does not, however, have much memory so the rib is quite loose. No idea why I'm pulling such a silly face! It took one day of knitting and will be ideal for my trip East! 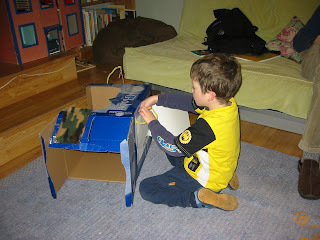 Nigel bought us a globe at the weekend - Finlay was more interested in the box of course. 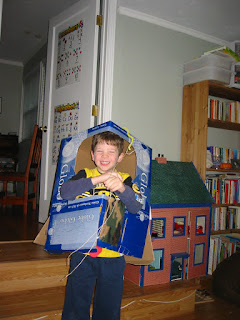 He immediately constructed himself a Robot costume complete with a control panel and petrol filler cap. You can also see the antenna in this photo - for sending and receiving signals from space. I finished my hourglass sweater and have already worn it all day! 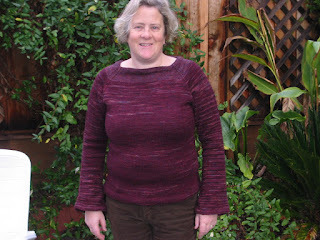 The pattern is the Hourglass Sweater from Joelle Hoverson' 'Last Minute Knitted Gifts'. The yarn is Dream in Color Classy in the Gothic Rose colourway. It's a 100% superwash merino. I bought 4 skeins online but ran out of wool just below the neckline. I bought an additional skein from Purlescence Yarns - I took the sweater in to match, but even so, the match is not great. I modified the pattern slightly; I omitted one of the waist decrease rounds; I added a sleeve decrease round at the wrist; and I added several more decrease rounds at the neck to give a slightly higher neckline. Overall I'm very satisfied with this sweater. I intended to make an everyday wearable sweater and I think this fits the bill. The pattern is well written and easy to follow, and its construction gives lots of opportinity to adjust the fit to a custom fit. I based the dimensions on a often-worn shop-bought sweater, and it worked out very well here for me. The yarn yardage issue was not the fault of the pattern; I slightly underbought as I increased the length of the sweater by a couple of inches. Recovering from flu, and surfing the web, I came across this instant lavender bag idea on a blog - but can't remember which one. I needed to get some dried lavender for another project and ordered these little bags from the the same place. 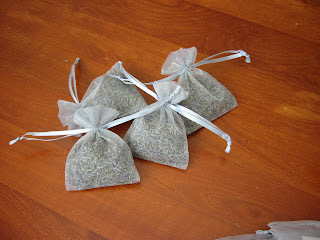 They are wedding favour bags - but make perfect little instant lavender bags. Hopefully they will be a suitable moth deterrent now my source of italian moth repellers is drying up! Nancy requested some socks "in the same string as Mummy's socks". I looked in my wool chest and found that I actually had quite a bit of wool left over from Gill's socks (small feet and short socks) and so was able to oblige. The yarn is poshyarn Lucia (70% merino 30% cashmere) but I dont remember the colour name...jolly pretty anyway. 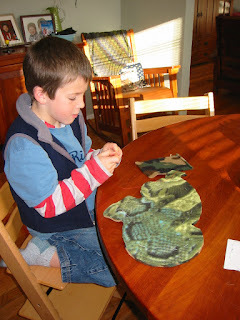 Adam has done quite a bit of sewing at his after-school care and when his teacher offered him the dinosaur pattern on the polyfil bag he jumped at it. This weekend we were all starting with the flu so it seemed a good opportunity to make dinosaurs. Adam chose the fleece; camo for one side, lizard for the other (he couldn't decide). He also chose a bright red thread so his neat stitching would show. He really does have neat stitches. 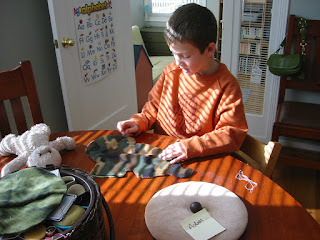 Finlay of course had to join in and so Adam showed him how to do blanket stitch. 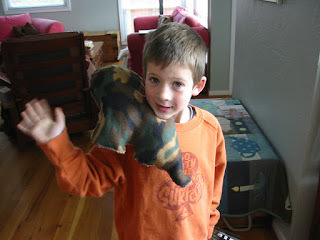 Finlay had some help with his sewing but Adam sewed all his dinosaur himself. 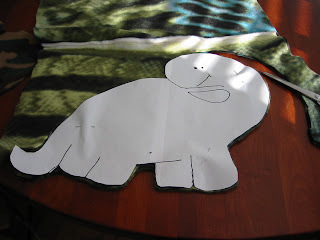 Here is Finlay's dinosaur. We didnt add the eyes and mouths yet because the boys couldnt decide how they should be. 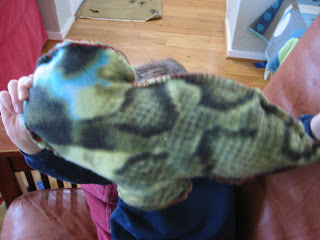 The dinosaurs turned out really well, didn't take too long to make, and they have both become snuggly bedtime pillows. Finlay and I went on an expedition to Daiso in Mountain View in search of cheap knitting needles. They didnt have any of the aforementioned needles but did that stop us shopping? Oh no! 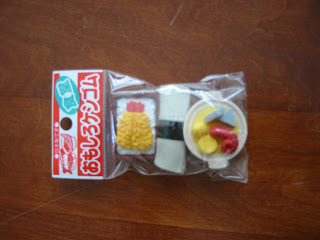 Of course the usual array of stationery - here a blurry photo of sushi erasers - but I did buy more than this ;-). 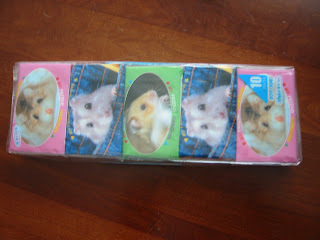 An irresistable package of tissues with hamsters. 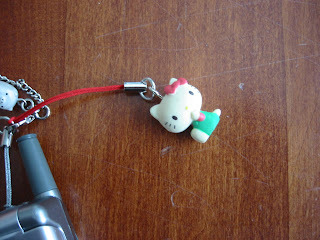 And the inevitable Hello Kitty item. 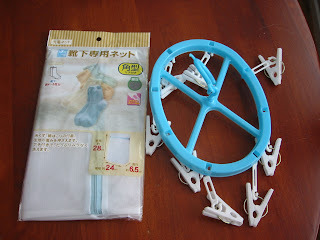 I bought this to hang in my car but the string is too short. I had a Hello Kitty dangly thing in my first car (The Singer Chamois Sport with the brown fur head-lining) and I guess I feel that the current minivan needs more of the sprit of brown fake fur! There was of course more than this...I came away with a huge bag of stuff for $21. Finlay had $3 to spend and bought a set to make balloon animals and a bubble gun for Adam. 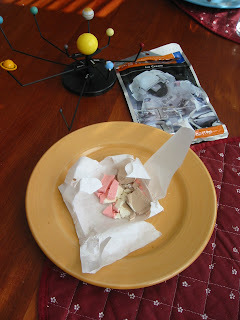 In my christmas stocking I received some astronaut ice cream. We shared it for lunch yesterday. Finlay brought his solar system model so we could really feel as if we were in space. My father brought some back for us many years ago from a trip to Houston (I think) and I remember that we ate it, but not what the taste was like. This ice cream tasted exactly like neapolitan ice cream but without any of the texture. The best effect is to let the ice cream 'melt' on your tongue. I'm guessing that in space you are grateful for any sort of variety in your freeze-dried meals. I don't think Ned will care! 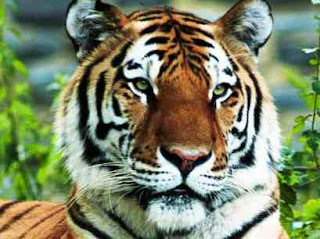 (Actually I think it does look like a real tiger when I compare it to the photo). Teeny tiny tiger socks of course! These are for Ned. I'm also planning to knit some for Finlay from the same ball - I should have plenty of yarn. 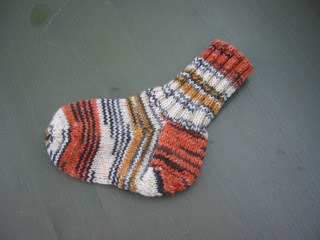 Child socks are quick to knit and use little yarn - I can usually get a boy pair from left overs from my socks. I like short socks for myself so its nice to get the most from the wool. This is Opal rainforest in the Tiger colourway. This is the new version of the tiger stripes and it still does not seem that tiger-like to me. Maybe it is like real tigers and I can only conjour up Tigger in my mind? 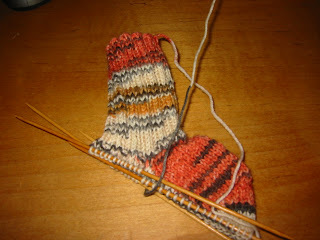 Hopefully Gill will measure his feet soon so I know how long to knit them! I'm breaking with a lifetime of habit here and have two sweaters on the needles at the moment. 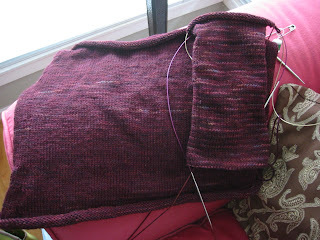 The first is my hourglass sweater which is coming along. On the body I alternated from 2 skeins of yarn but Im not pleased with how the yarn carries on the inside. The sweater is knit in the round and the carrying seems to show on the outside of the sweater. I'm optomistic that pressing will fix it however have now given up on the alternation with the result that the sleeves appear rather different from the body...maybe it will look like a design element because I'm certainly not going to frog it now. I also cast on for the chicknits ribby cardi. I have had the artyarns supermerino for a while. I originally bought it for a vest (tank top) but realized I didnt have enough - so i'm knitting the sleeves in this variegated yarn. I tried to match one of the colours with the solid - in this case it's Steinbach Wolle Eroica which has the dual benefits of being machine washable and also cheap ($4.50/ball). Of course one sweater is miles of interminable stockinette and the other miles of interminable ribbing - so at least I have some variety! These last few days have seen some severe weather here in California. The 80 freeway to Tahoe has been closed for much of the time since we got back from Northstar - I'm glad we came back on Wednesday and didn't try to stay later for the snow! Yesterday we had a respite after the fierce storm of Friday. We used the time to clear all the dropped branches from the yard and out of the pool. 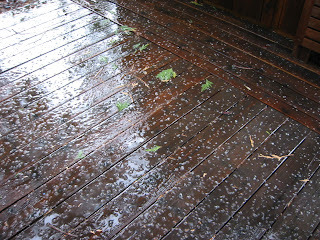 ...hail! The boys had not seen it before and we really interested that it was like little ice cubes. I'm reading Jeremy Clarkson's And another thing * in which he highlights the ability of the British to talk about the weather. He claims no other country can rival this level of interest in weather. I need to strongly disagree (with this and many other of Jeremy's positions...which is of course the point of reading the book!). Anyway - my point is that Jeremy has clearly never spent much time in California and experienced the media frenzy that weather can generate here. It's especially remarkable in that California weather is nothing if not predictable - this storm was forecast all through the previous week. 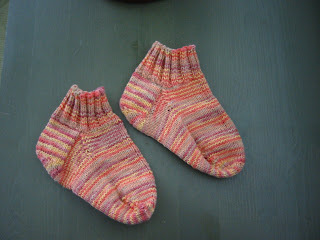 These for me knitted from Aracunia Nature Wool. The colour came out much nicer knitted up than in the skein. I have a lot of this yarn left as the yardage is great. 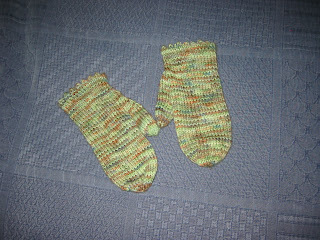 I used a pattern from Yarn Forward Magazine: Maddie's Mittens. However, as I knitted them it became apparent that these were child mittens so I had to make some last-minute adjustments. Anyway - as it turned out they fit me just fine. 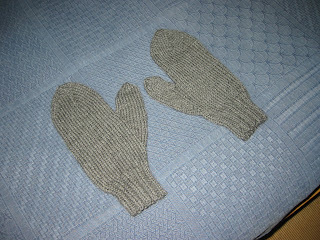 I also knocked up a pair of manly mittens for Nigel using some Cascade 220 that I had in stock (!). I had planned to put a red stripe around them, and even took the red wool to Northstar to do it - but somehow the grey mittens were just so mesmerizing that I knitted the entire thing before remembering my red stripe. Ferretworld has just returned from it's annual pilgramage to Northstar. We stayed again at the Ski Trails condos - close to the trail and with the advantage of a toboggan slope behind the apartments. 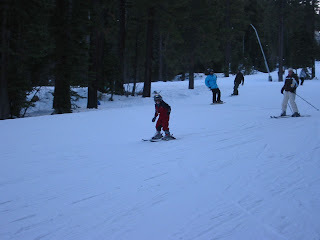 Adam did a couple of days of ski school and consolidated his skiing style. 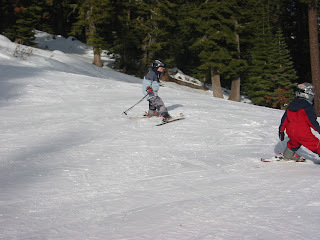 He is working on parallel turns and can execute them well on the more gentle slopes. 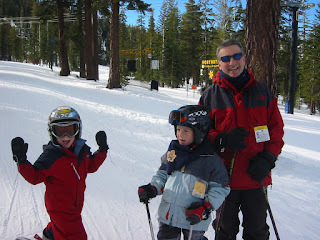 We had a great day skiing with Adam while Finlay did a 3rd day of lessons. 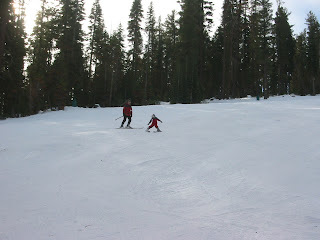 We skied all over the mountain from the top of Mount Pluto back to the village. We really don't have to wait for Adam these days! On our last day we all went skiing together. 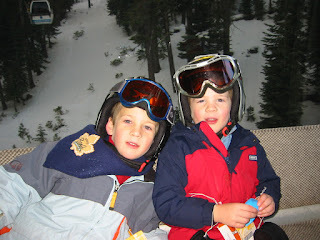 The boys here in the gondola. We really had a great time together. It's the first time that we have truly skied all together. 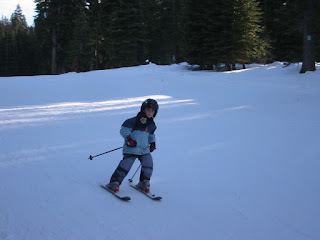 Finlay was keen to tell everyone that he skied down Loggers Loop without holding anyone's poles. The boys were great together; Adam looking after Finlay, and trying to lay down a good set of tracks for F to follow. The follower sometimes wants to go faster though! 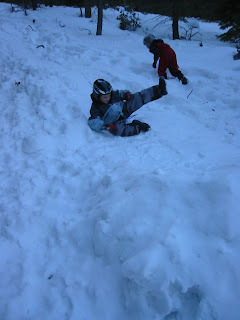 Of course what they both really wanted to do was go on the Terrain Parks...but we just watched instead! I believe it's only a matter of time until I'm watching my sons hurtle over these ramps and jumps!